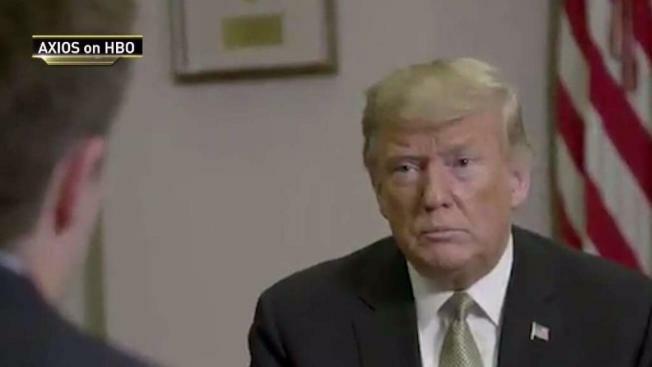 President Trump says he intends to sign an executive order limiting birthright citizenship. Tracie Strahan reports. President Donald Trump is making another hardline immigration play in the final days before the midterm elections, declaring that he wants to order an end to the constitutional right to citizenship for babies born in the United States to non-citizens. But such an order may violate the Constitution. Most scholars think he can't implement such a change unilaterally. Trump made the comments to "Axios on HBO" with seven days to go before high-stakes elections. Trump, seeking to energize his supporters and help Republicans keep control of Congress, has stoked anxiety about a caravan of Central American migrants and refugees making its way to the U.S.-Mexico border by foot — the group is still hundreds of miles away from U.S. soil. Trump's administration announced Monday it was dispatching thousands of active-duty troops to the border, and Trump said he'd set up tent cities to house asylum seekers. Trump has long called for an end to birthright citizenship, as have many conservatives. An executive order would spark an uphill legal battle for Trump about whether the president has the unilateral ability to declare that children born in the U.S. to those living here illegally aren't citizens. Most scholars think he can't. Asked about the legality of such an executive order, Trump said, "they're saying I can do it just with an executive order." He added that "we're the only country in the world where a person comes in and has a baby, and the baby is essentially a citizen of the United States." According to the CIA World Factbook, the U.S. is one of more than 30 countries that offer citizenship by birth, many of them in the Western Hemisphere, including Canada, Mexico, Brazil and Argentina. The Pew Research Center found in a survey published two years ago that births to "unauthorized immigrants" were declining and accounted for about 1 in 3 births to foreign-born mothers in the U.S. in 2014. About 275,000 babies were born to such parents in 2014, or about 7 percent of the 4 million births in the U.S. that year, according to Pew estimates based on government data. That represented a decline from 330,000 in 2009, at the end of the recession. An excerpt of Trump's interview was posted on Axios' website on Tuesday. The president said White House lawyers are reviewing his proposal. It's unclear how quickly he would act and the White House did not provide further details. A person familiar with the internal White House debate said the topic of birthright citizenship had come up inside the West Wing at various times over at least the last year, but has some internal detractors. White House lawyers have debated the topic, and expect to work with the Justice Department's Office of Legal Counsel to develop a legal justification for the action. It is one of many immigration changes being discussed including asylum law changes, and barring the migrant caravan from entering the country. But administration officials said there would likely be no decisions until after the midterms, due in part to the president's trip to Pittsburgh Tuesday to meet with victims of the deadly synagogue shooting. The Supreme Court ruled in 1898 in the case of a child born to Chinese parents in the U.S. that the amendment "includes the children born, within the territory of the United States, of all other persons, of whatever race or color, domiciled within the United States." Legal experts questioned whether Trump has the authority for his proposed executive action. Omar Jadwat, director of the Immigrants' Rights Project at the American Civil Liberties Union in New York, said Tuesday that the Constitution is very clear. "If you are born in the United States, you're a citizen," he said, adding that it was "outrageous that the president can think he can override constitutional guarantees by issuing an executive order." Jadwat said the president has an obligation to uphold the Constitution. Trump can try to get Congress to pass a constitutional amendment, "but I don't think they are anywhere close to getting that." "Obviously, even if he did, it would be subject to court challenge," he added. Suzanna Sherry, a professor of law at Vanderbilt Law School specializing in constitutional questions, said those advising Trump that he can change the Constitution via executive order are simply mistaken. "He can't do it by himself and, in fact, he can't do it even if Congress passed a statue." "I think it would take a Constitutional amendment," she said. "I don't see it as having any plausible legal basis," she said. But others suggest the president may have an opening. Jon Feere, a senior adviser at Immigration and Customs Enforcement, is among those who has long argued that that the president could limit the citizenship clause through executive action. "A president could direct his agencies to fall in line with his interpretation of the Supreme Court's rulings, which are arguably limited to children of permanently domiciled immigrants (the court has never squarely ruled on children born to tourists or illegal aliens). He could direct his agencies to issue Social Security numbers and passports only to newborns who have at least one parent who is a citizen or permanently domiciled immigrant," he wrote in 2015 in an op-ed in the Hill. If such a plan worked, it would likely create a "whole different class of people, right from birth," according to Muzaffar Chishti, director of the Migration Policy Institute's New York office. That underclass would be similar to "Dreamers," young people who were brought into the country by undocumented parents and whose legal status often hinders their professional growth once they finish high school, Chishti said. He also said birthright citizenship makes documenting citizenship much clearer — after the United Kingdom ended birthright citizenship, he'd heard of cases in which it took years to prove people qualified under the new rules. "There are so many disadvantages we get handed by life, but at least in the U.S. we say at birth, legally, we're not going to handicap you," he said. In the final days before the Nov. 6 midterms, Trump has emphasized immigration, as he seeks to counter Democratic enthusiasm. Trump believes that his campaign pledges, including his much-vaunted and still-unfulfilled promise to quickly build a U.S.-Mexico border wall, are still rallying cries for his base and that this latest focus will further erode the enthusiasm gap. Trump voiced his theory that birthright citizenship could be stripped during his campaign, when he described it as a "magnet for illegal immigration." During a 2015 campaign stop in Florida, he said: "The birthright citizenship - the anchor baby - birthright citizenship, it's over, not going to happen." The Citizenship Clause of the 14th Amendment states: "All persons born or naturalized in the United States, and subject to the jurisdiction thereof, are citizens of the United States and of the state wherein they reside." The amendment was passed by Congress in 1866 during the period of Reconstruction after the Civil War. It was ratified in 1868 by three-fourths of the states. By extending citizenship to those born in the U.S., the amendment nullified an 1857 Supreme Court decision (Dred Scott v. Sandford), which ruled that those descended from slaves could not be citizens. In addition to the debate over Trump's authority to declare that children born in the U.S. aren't citizens, a separate question is whether Congress could pass a law to that effect, or whether only a constitutional amendment could accomplish Trump's apparent aim of denying citizenship to U.S.-born children of those here illegally. Republicans in Congress continue introducing bills to end birthright citizenship, including legislation this session from conservative GOP Rep. Steve King of Iowa who has aligned himself with some nationalist political leaders abroad. King's bill has almost 50 co-sponsors in the House. King's legislation though would likely face a cool reception in the Senate where there is no companion bill pending, and only a handful of senators supported past efforts. King said he had not discussed the issue with the president at any length in recent months, but that it had come up "in passing" several times in group discussions. He said he hadn't personally considered birthright citizenship to be part of the caravan issue and applauded the president for connecting the issues. "Sending this message out, it's another component of saying to the caravan: Don't come in here. Some are pregnant, no doubt," he said. Sen. Lindsey Graham of South Carolina, now a close ally of the president, also tweeted his support for the change. "This policy is a magnet for illegal immigration, out of the mainstream of the developed world, and needs to come to an end," he said. AP's Jill Colvin, Deb Riechmann, Colleen Long, Mark Sherman, Lisa Mascaro, Zeke Miller and NBC's Asher Klein contributed.